Unified managed accounts represent the future of the managed money industry. Mutual fund wrap accounts are enjoying a resurgence in popularity. Exchange-traded funds have exploded in popularity with clients and advisors. Client demand is fueling the growth of alternative investments. Stephen D. Gresham is Executive Vice President and Director of Retail Markets for Phoenix Investment Partners, Ltd., the $42 billion asset-management division of The Phoenix Companies. Prior to joining Phoenix, he managed his own wealth-management consulting firm, The Gresham Company, LLC, which served a global clientele of more than fifty financial services companies. He is also author of the recently released Wiley title Advisor for Life, as well as The Managed Account Handbook and Attract and Retain the Affluent Investor. Gresham serves on the Board of Governors at the Money Management Institute and is a founding board member of the International Money Management Institute. Arlen S. Oransky is Vice President of the Money Management Institute, the national organization representing the managed account solutions industry. He leads the organization's membership acquisition and retention efforts. Oransky has over twenty-five years' experience in the financial services industry working with leading advisors and has served as senior vice president for Weiss, Peck & Greer Investments and as vice president and product manager for TIAA-CREF. The managed account industry, which began amid pension reform, has mushroomed in response to clients’ demands for a consistent process to manage their investments. Unified managed accounts have evolved as investors sought greater coordination among their investments and more diversified portfolios. Financial advisors can leverage the potential of multiple mutual funds in a single client account by using a mutual fund advisory account. Alternative investments offer greater diversification and risk management than ever before, and many clients are asking that alternatives be included in their portfolios. Managed account solutions allow for a more efficient use of the advisor’s time, access to a more affluent clientele, a consistent revenue stream leveraged by the market’s growth, and a more valuable business entity; plus, clients prefer fees over commissions. Are managed account solutions right for you? Here’s how to evaluate your potential for success. Step-by-step instructions for explaining managed account solutions to clients and prospects, gathering information and developing an investment policy statement, and structuring an effective client meeting. Referrals from current clients can bring prospects to your door, but you must know how to ask for them and have materials on hand to promote your practice. By cultivating mutually beneficial relationships with service providers, allied professionals, and the media, you can develop a steady stream of referrals to help grow your business. 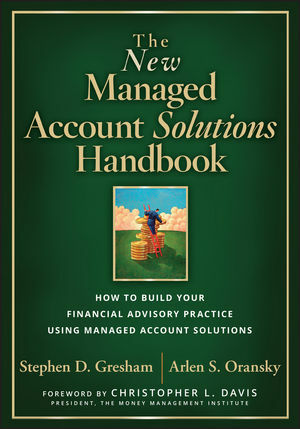 Seminars remain an effective marketing tactic in the sale of managed accounts. Here are proven techniques for staging a successful meeting and building your reputation. Throughout the course of the client relationship, you will have multiple opportunities for capturing additional assets and building your managed account business. Industry leaders present their visions of what the future holds for managed account solutions and the advisors who provide them.